Sackville Town Councillor Bill Evans says he’s “gobsmacked” by the news that the second phase of the town’s Lorne Street flood control project could cost nearly $6 million, twice as much as the $2.9 million in federal, provincial and municipal money set aside for it. “The elephant in the room is finding out that something we thought — our consultants said — would be three million is six million,” Evans said during town council’s meeting on Tuesday. 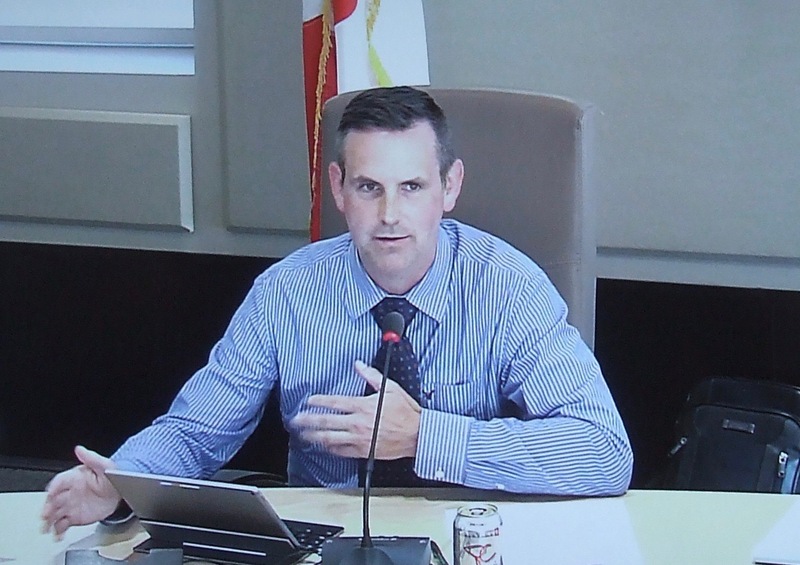 He was commenting on a report from Town Engineer Dwayne Acton that the lowest bid on Phase II of the $2.9 million Lorne Street project came in at just over $5.9 million even after the town had made substantial reductions to its original plans. 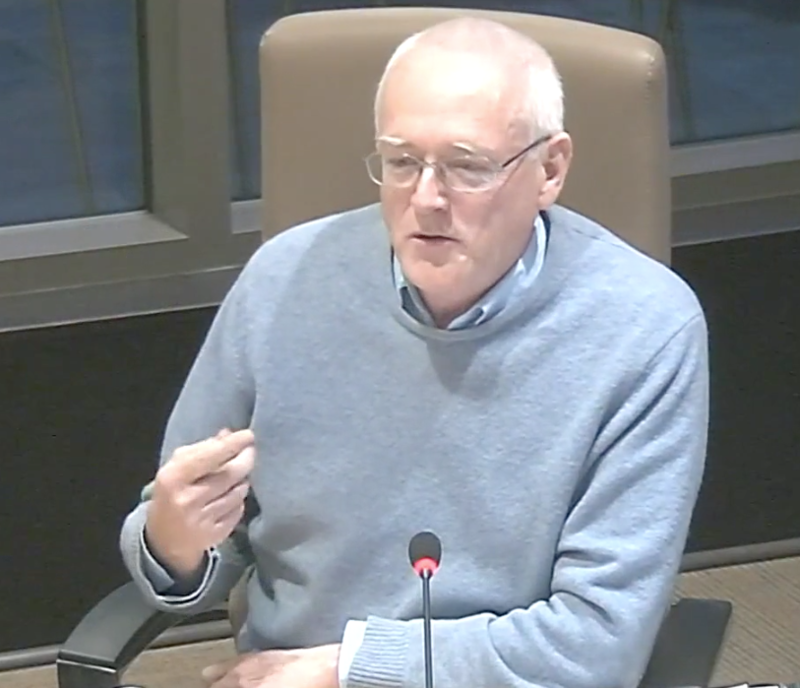 Acton responded to Evans by saying that consultants Crandall Engineering of Moncton are reassessing the project to see if there are other options for draining flood waters from the Lorne Street area to the Tantramar River. He also defended Crandall’s original estimates of the project’s costs. The town’s plans called for construction of two large retention ponds connected by deep drainage ditches that would discharge flood waters through a double-gated aboiteau into the Tantramar River at low tide. But last month, Acton said the town had eliminated the second, larger retention pond to stay within the $2.9 million budget. To read about elimination of the second pond, click here. To read about the town’s original plans for three ponds, click here. Andrew Black was the only other councillor to comment on the doubling of costs for the Lorne Street project. “Not to be too mean, but I would question the ability of the consultants to predict this, I mean it seems huge,” he said. Acton answered that after a brief discussion, the consultants are re-looking at things. Chief Administrative Officer Phil Handrahan added that the project is complex. To read earlier coverage of Phases I and II of the Lorne Street project, click here. Aside from eliminating the second water retention pond from its tender for Phase II, the town also eliminated construction of the large ditch and control structure that would funnel water from the first retention pond south of St. James Street under Charles Street on its way to culverts under the CN Rail tracks. According to town Treasurer Michael Beal, the $200,000 still left over from Phase I of the Lorne Street project could be applied to the Charles Street crossing. This entry was posted in Town of Sackville and tagged Crandall Engineering, Lorne Street Phase Two. Bookmark the permalink. If only the Consultants from Moncton would actually CONSULT with the knowledgeable local citizens, they would find there are several other much more viable and practical options that should be pursued, at far less cost than the unnecessarily complex proposal which went to Tender. If only consultation with the local citizens for this project was just a tiny bit like the way the citizens were consulted for the very thorough Ekistics Exit 506 Study, then we would surely not be in this financial predicament. Any reason why the rest of the Councillors did not voice their concerns? Note from Bruce Wark: I have to confess Rima that I did not attend the meeting as I was in Ontario on vacation. I based my report on the recording of the council meeting as well as a couple of telephone interviews. During the meeting, town engineer Dwayne Acton reported on a long list of public works projects. The most dramatic one was the Lorne St. Phase II project. Another interesting one involved the $17,000 plan to replace the retaining wall at Main St. and Wright that council approved in January. Acton said the town is now considering putting a sidewalk there instead. Thank you for your response Bruce. I also appreciate the additional information. I hope you had a relaxing vacation in Ontario. I would suggest that if local residents have ideas that could make this less costly that they should set up meetings with councillors and get these ideas on paper so that councillors can bring them forward during discussions with the consultants. You don’t need to wait to be “consulted”, bring your ideas forward through your government, that is their job, to represent you in processes like this. A good consulting company would gladly work with the potential client to reach an agreeable cost, because a lower-cost project that actually goes forward is of greater value to them than a high-cost project that goes nowhere. That has been tried unsuccessfully Nathan. The Town of Sackville has been asked, via email, as to whether Crandall Engineering has any experience working with this type of project and such specified soil conditions. After a year we are still waiting on a reply to that email. Extensive bore hole drilling and testing along the proposed route through the marsh areas, as well as the highlands locations, was carried out by Stantec Consulting Ltd from December 1, 2017 through to February 1,2018. On February 28, the very extensive Geotechnical Design and Construction Recommendations Report was presented to Crandall Engineering. ALL the warnings were included. This complete information package was also included in the Tender documents. So — I am sure that All of the engineers involved were very well ‘educated’ as to what they were ‘getting into’ well in advance of the Tender being issued and the estimate and budgeted amounts should have reflected that. The flooding of the Lorne Street area of town needs to be resolved and cannot be delayed any longer. The changing climate conditions mean that more flooding of this area (and perhaps even a greater area of Town) will be more frequent . I was at a Town meeting a year or so ago where Mr Percy Best submitted a cheaper proposal to help with the Lorne Street flooding problem; should this proposal again be considered by Council since the price of the project has now increased substantially ? Could Mr. Best’s original proposal be reworked to complement the completed Phase 1 development & so be a more affordable option than the ‘over budget’ Phase 2 proposal ? Here is an idea, could we not install one of those giant lift pumps for half a million or is that just too simple of an idea ? I would recommend finding another consultant and withhold payment to Crandall for the spotty work or take them to court to get our money back. The CAO’s position on the matter is pretty telling too: there is a serious lack of accountability in that town hall these days. Neworleans is like a giant saucer below sea level and they have Hugh lift pumps that run 24/7 pushing thousands of liters per second to cannels. That is an extreme example of how flooding is being handled. I am thinking we would only need a fraction of that type of system. When I was a kid I can still remember Merlin Hicks running drag line on the marsh rebuilding the dikes, infact that old drag line is still here in Sackville. With the combination of retaining pond, pump station and rebuilding of our dyke system could that work ? Oops couple of typo’s *huge not Hugh and *dykes not dikes.